Battery, this supplies the electrical energy. Ignition Coil, transforms the battery low tension current to high tension current which can jump the spark plug gap in the cylinders under compression. Distributor, delivers the spark to the correct cylinders and used the mechanical breaker, this opens and closes the primary circuit at the exact time. Spark Plugs, provide the gap in the engine cylinders. Wiring, connects the various units. 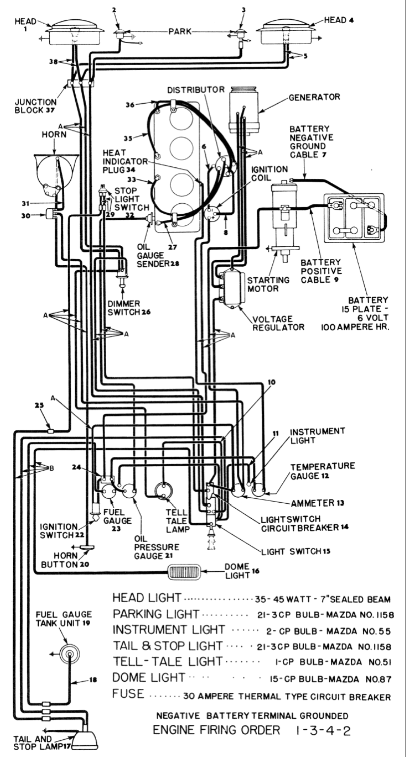 Ignition Switch, controls the battery current when desiring to start or stop the engine. Distributor: The distributor is located on the right side of the engine and is operated by a coupling on the oil pump shaft, this is driven by a spiral gear on the camshaft. The spark advance is automatic, controlled by built-in centrifugal weights. 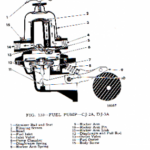 Some parts of the distributor can be checked or replaced while the distributor is mounted on the engine, it is best to occasionally remove it for a good check. Detailed instructions on the removal of your old worn out distributor and installation new distributor. 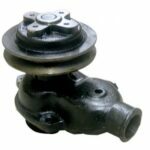 Distributor Cap: The distributor cap should be inspected for cracks, carbon runners and evidence of arching. If any of these occur, the cap should be replaced. Clean any corroded high tension terminals. Rotor: Check the rotor for cracks or excessive burning at the end of the metal strip. The end of the rotor will become burned after normal use. If the top of the rotor is burned it shows the rotor is too short and needs replacing. When this condition is found the distributor cap segment will be burned on the horizontal face and the cap will also need replacing. Condenser: The condenser lengthens the life of the distributor points by preventing arching at the contacts. Also it provides a hotter spark by creating a reverse surge of current which rapidly breaks down the magnetic field of the coil by demagnetizing the core. If the condenser is leaky a weak spark will occur. Check the condenser lead for broken wires or frayed insulation. Clean and tighten the connections on the terminal posts. Make sure the condenser is mounting firmly on the distributor for a good ground connection. 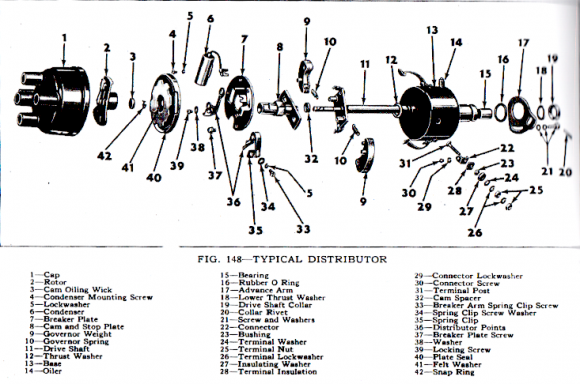 Examine the distributor points. If showing wear, poor mating, transferred metal, or pitting then new ones should be installed. Clean the points with a proper solvent and a stiff bristled brush. Check the alignment of the point for a full contact. If not properly aligned, bend the stationary contact bracket slightly to provide alignment. The contact gap should be set at .020″ measured with a wire gauge. The gap is adjusted by loosening the lock screw and turning adjustment eccentric screw until correct gap. The fiber block on the breaker arm should be resting on the highest point on the cam while the adjustment is made. Recheck the gap after locking adjustment. Apply thin film of cam lubricant to the cam to lessen fiber block wear. Check point contact spring pressure, should be between 17 and 20 ounces. Check with a spring scale hooked on the breaker arm at the contact and pull at right angle to the breaker arm. Execute the reading just as the points separate. Adjust the point pressure by loosening the stud holding the end of the contact arm spring and slide the end of the spring in or out. Re-tighten the stud and check the pressure. Too low pressure will cause engine missing at high speeds. Too high a pressure will cause rapid wear of the cam, block, and points. If it is time for the distributor to be replaced use this Helpful Guides and Illustrations: Electronic Distributor – Install Guide to help you navigate your way through this process. 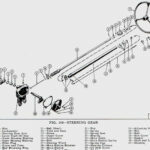 How to remove the ignition coil from your Willys Jeep – Part of an ongoing “Jeep” disassembly and restoration series sponsored by Kaiser Willys. Direct replacement for all 12 volt systems. Comes complete with cap and simple wire hook up with instructions. Does away with old points and moving parts of original distributors. 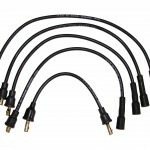 Q: What type of coil can be used? If coil requires a ballast resistor, do the internal electronics replace the resistor or do I still need to use it? Do I remove the stock condenser? A: You want to use an internal resist coil. But you can use an external resist coil. The instructions come complete with how to wire up either. It is very simple to do. Q: Can a vacuum advance be fitted? A: No it doesn’t need it. It uses a centrifical advance. Q: Are replacement caps, rotors, available? A: Sure. Please call me toll free. If you are looking for, Willys Jeep Electrical Parts, or Willys Jeep Restoration Parts and much more for your 1941-1971 Willys vehicle, you have come to the right place! Hi Patrick, unfortunately no one makes one in 6 volt. If you have any other parts or tech questions feel free to give Mike M. a call toll free 1-888-648-4923 Mon-Fri 9AM-5PM EST or email mike@kaiserwillys.com and he will be happy to help! Do you have an electronic ignition for 6 volt systems. I havea 1957 DJ3A w/6volt system with a IAY4001 Distributer. Hi Ken, the black wire should be positive and the blue wire negative. 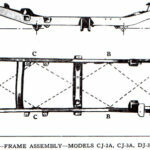 Here is a link to the distributor install guide if you need further assistance. Let us know if you have any more questions! 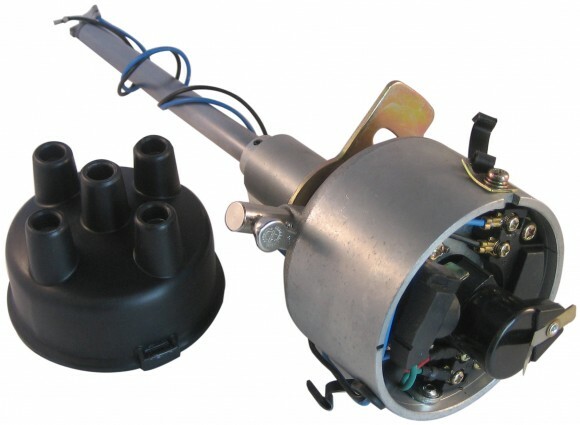 Hi Erik, Yes the electronic ignition distributor is an improvements over the points system, the points are subject to mechanical wear and require regular adjustment. How well do these work? Are they an improvement over the old points system? They are usually stamped internal or external. Or check to see if there is a ballast resistor next to it… Feel free to call us at (Toll Free) 1-888-648-4923 (Mon-Fri, 9AM-5PM EST) if you have any questions! How can I check if my coil has a resistor? What are the specifications of the ballast resistor if required?